Ohio Boxster is going to share with us his experience in this very interesting topic! Ok, thanks. I think it would be best to start out with a price list. This is what I have spent to date. Last edited by ohioboxster; 06-16-2008 at 12:00 AM. Are you doing the install yourself? Yes, the week of 09-04-06 Im off work for a few weeks and should have all the parts to finish. Can I suggest some M1 15W-50 or Red Line of the same weight. I worry about that engine under pressure. I could be being too cautious. This is a pic of me admiring my soldering work. I soldered all connections and used shrink tubing where I could. As you remember the Digi box was installed but not wired. Last night I started to wire it and finished up today. This is the wiring harness that I need to tap into, Im looking for the violet and green wire along with the red and blue. One is the tach signal the other is 12v switched. Its pin 54 and 80. This is the pic after I taped into the harness, soldered the wires and rewraped. Now its all wired and reinstalled, looks pretty good huh? This is where I ran the wires and vacuum line into the engine bay. Dont worry nobody will ever see the holes. These are the additional fuel injector wires that go to the box in the trunk. I zip tied the out of the way after soldering the connections. The box is all wired ready to go. This is the fuel regulator that I need to tee into and run a vacuum line into the trunk to the Digi box. As boost increases the box fires the 7th injector. There, I teed into the vacuum right here. I still need to tee into the line again for my boost gauge. I will decide where after the gauge gets here and I figure out where to mount it. This final picture is the box behind the carpet. You will never know its there. Sorry if this appears to be going backwards. I wasnt allowed to post all the pics in one post. Im not real sure how to correct that. I think getting the box all wired will save alot of time toward the end of the install. This is actually the last step in the install manual but I realized when I posted the price list I failed to order the O-rings for the spark plug tubes. I ordered the tubes as well, If Im going to be that under there and have the plugs out I might as well change them too. I took the car for a test run and I didnt freak the computer out. I was a little worried but it ran great. Next I will take pics of the boost gauge install. I would welcome suggestion on where to install it. nice work, is the supercharger installed on the box yet? if so, any pictures? Last edited by CJ_Boxster; 08-22-2006 at 03:34 PM. Thanks, No this is a play by play. Pretty much what you see is my progress up to date. The install date is 09-04-2006, thats when I start vacation and I can just take my time. I'd like to know how you convinced Vin Diesel to install your supercharger?? I have to admit I was thinking the same thing....Ohio, you are one badass looking mofo. 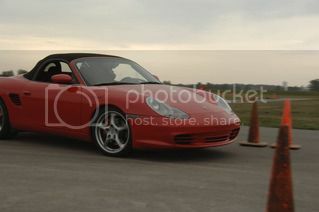 If anybody says the boxster is a chick car I will just show them your pic and that should squash any issues lol. Anyway back to the install this is good info. What kind of boost are you expecting to get out of this thing? Are you going to throw it on a dyno when it's done? Last edited by Adam; 08-22-2006 at 10:36 PM. Its supposed to be only like 4.5 lbs of boost which is ok for me. My plan is to take it to the dyno to make sure my air/fuel is correct. The Diesel comments cracked me up, I try to stay in half way decent shape. The Boxster is no chick car,lol. The Diesel comments cracked me up, I try to stay in half way decent shape. Try to stay in half decent shape? Dude, your shoulders are bigger than your head! Heres the gauge, it came today. Now to find a mounting location. This will match my silver face gauge cluster. Yes, my head is shiny, just polished. Last edited by ohioboxster; 12-18-2006 at 03:00 AM. This is where I would like to install the boost gauge but I started to think long term. If I sell the car with no blower then I have a hole in the dash, you never know. This is where I tee'd into the vacuum line, zip tied in a few spots to keep it from moving around. I ran the vacuum line under the center console and zip tied it to existing wires. This is where I ended up putting it. Gauge functioning at idle, still need to wire light had to break for some chow. Last edited by ohioboxster; 08-24-2006 at 12:57 PM. Although not exciting it was necessary. I cleaned all the machined surfaces that mate and the duct work. Found a few spiders living in my pipes. Getting the blower cleaned up. This is the oil for the blower, I ended up using probably one and a half bottles. This is what the spark plug tubes look like that Im going to replace along with o-rings, if your interested. I changed my cabin filter, look how dirty. Yeah man, Ohio your about 3 sets of 10 from shoulder muscles growing on your shoulder muscles!